Disney on Ice BOGO FREE Coupons! Here's info on an awesome event this weekend! Also remember to enter the Disney on Ice Ticket giveaway here. ENDS 10/20! Here is the list of other blogs giving them away. Saturday, October 23rd 11:00 a.m. - 1:00 p.m. Kids, Moms & Dads; Come dressed up as your favorite Disney Character and go trick or treating at KUDD Radio Canopy, the KYLZ Radio Canopy and the Disney On Ice Canopy. 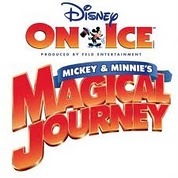 Enter to win one of 10 VIP Family four Packs of tickets & a VIP Disney Meet & Greet with Mickey & Minnie Mouse at the opening night engagement of the Disney On Ice presents Mickey & Minnie’s Magical Journey playing at the Energy Solutions Arena November 11 – 14, 2010. Play games and win Disney On Ice prizes, while supplies last. Tickets must be purchased between Saturday, October 23rd and Saturday, October 30th & can only be purchased at the Energy Solutions Arena Box Office & must accompany a valid coupon. Coupon can only be obtained at the Disney On Ice Canopy at the Gateway Mall on Saturday, October 23rd between 11:00 am & 1:00 p.m. while supplies last, only 1000 will be distributed. Offer is valid for the $13, $16 & $23 price levels and is valid for the Friday, Nov. 12th 4:00 p.m. performance, the Saturday, Nov. 13th 6:30 p.m. performance and the Sunday, Nov. 14th 1:30 p.m. and 5:30 p.m. performances. Offer is not valid with any other offer, VIP tickets, Free tickets or Kid Tickets. Please note: Only 1000 coupons will be distributed on a first come basis. Disney On Ice presents Mickey & Minnie’s Magical Journey takes audiences on a fun-filled tour to four exciting destinations filled with favorite Disney friends. With Mickey Mouse and Minnie Mouse as tour guides, guests will visit the enchanting worlds of Disney’s the Little Mermaid, The Lion King, Lilo & Stitch and Peter Pan. Disney On Ice presents Mickey & Minnie’s Magical Journey performs at the Energy Solutions Arena in Salt Lake City, November 11-14. Showcase Sisters is now following you from the Moms Review 4 You Wednesday Blog Hop! Please follow-back and enter our $55 CSN Stores Gift Certificate Giveaway!